Every once and a while I love to add a few new Instagram accounts I follow to our account. I particularly love finding people who seem to be creating and doing what they love. They make me happy and excited to follow each day and when their photos come through. I thought I would share a couple that have been inspiring and fun to watch lately. Bethany lives in Texas with her husband and four kids. She homeschools and also runs a business with her sister. Their home is an absolute dream, and they seem to be a fun family. Her feed never fails to make me feel excited about having a family. There are just some people you follow where you can feel their joy and contentment with life exude through their photos and her account is one of them. A favorite for sure. A husband and wife who renovate spaces together, but not in an HGTV way. These two hunt and find some of the most unique and amazing pieces for their clients while completely recreating a space to be something out of a complete interior dream. I discovered them after seeing they were the masterminds behind Local Milk’s gorgeous kitchen. Everything they create is amazing and unexpected but still classic and timeless. That takes hard work, and I love watching to see what they are working on. I am a sucker for an Instagram full of food styling. Hung does an amazing job making food look closer to art. For instance when you see this shot doesn’t it make you see the most basic essentials of toast and tea as something completely elegant? Not to mention I am in love with her color editing. Amazing stuff. Currently, I am going through a phase of fascination with styling and Zara nails it. She has an amazing eye and does so well capturing places on her travels. She is a must follow if you are obsessing about styling photos these days. I am a fan Tess’s design work and her creative direction in photo shoots. She is a very talented lady who also happens to live life well with her husband and daughter. Her photos are cute, full of life, and a little bit of humor, which I vibe with. I normally am not into accounts full of drone shots, but when I discovered this one I was in love. The colors, the unique perspective, and the images that feel a lot more like art than drone shots got me hooked. This guy has found a way to use a drone in a more than typical way, and I love seeing people take unique spins on items that seem to already be defined. He has for sure redefined the drone for me. 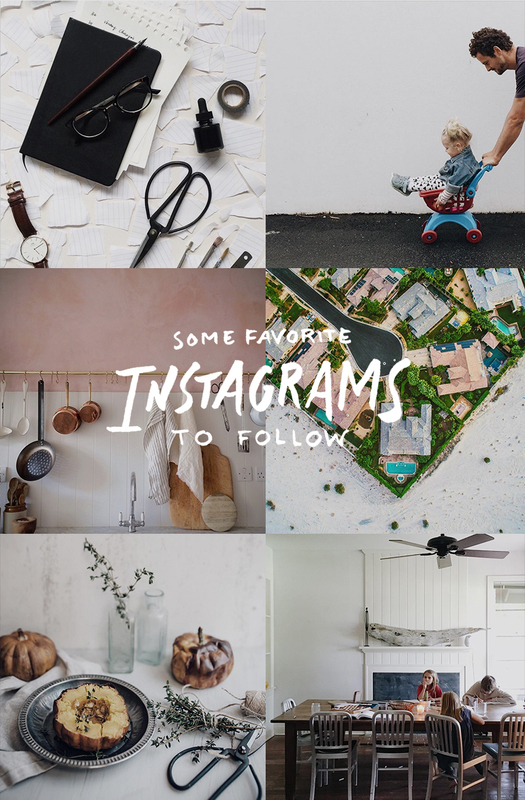 Is there an Instagram account you love following right now? I would love to hear! I really love @zoelaz account atm. her travel pictures are so full of vibes, just so good. I love them and followed them all, and I’m a fussy instagram follower. lol. I’ve been following you and mike for forever on the fresh exchange and adore your style. thanks for sharing the beautiful instagram accounts ! I share our adult sized treehouse and our airstream on my instagram @lynneknowlton. I hope you get a chance to pop over and say hello. I always like finding new and inspiring accounts to follow on Instagram! Can’t wait to look through some of these. These are awesome! found some new favorites to follow. and i love that you mentioned bethany– she’s awesome! i just finished up her webinar on modern thrive about refocusing. so good. Just followed Jet and Indigo and Zaaras! beautiful accounts! Thank you for sharing! I always lvoe following new people, and these are all gems! one of my absolute favourites to follow is @luisabrimble, her photographs and style are impeccable! YAY! I am totally checking them all out!!! !